“If we’re sliding toward recession, then it seems odd that credit markets are holding up so well,” continued the same CIO. “So keep an eye on those,” he said. “And if the curve is sending a false signal due to German and Japanese government bonds yielding less than zero out to 10yrs, then the recent Fed pivot and these low bond rates in America may very well spur a blow-off rally in stocks like in 1999.” A dovish Fed in 1998 (post-LTCM) and 1999 (pre-Y2K) provided the liquidity without which that parabolic rally could have never happened. Turkish overnight interest rates squeezed to 300% on Monday. Then 600% on Tuesday. By Wednesday, they hit 1,200%. Downward pressure on the Turkish lira, and the government’s efforts to punish speculators fueled the historic rise. Erdogan allegedly wants to limit lira loses ahead of today’s elections. The pressures that drove the currency lower were mainly of Turkish origin. Of course, the Turks have every right to their own economic policies, but they must bear the consequences. That’s what comes with being a sovereign state. The Greeks and Turks are neighbors. The Turks began negotiations to join the EU in 2005, with plans to adopt the Euro after their acceptance. Those negotiations stalled in 2016. As they look across the border at their Greek neighbors now, and see their interest rates stuck at -0.40%, are they envious? Perhaps. But having witnessed the 2011 Greek humiliation, would the Turks be willing to forfeit sovereignty for the Euro’s stability and stagnation? And how do the Greeks (and Italians) feel about having forfeited their sovereignty? “Only optimists start companies,” I answered. The Australian superannuation CEO had asked if I’m an optimist or pessimist. “I see the potential for technological advances to produce abundance in ways difficult to fathom. But I also see the chance of something profoundly dark,” I continued. He observed that people seemed consumed by the latter but spend so little time on the former. “That’s good. Humans are wonderful at solving problems of our own creation. The more we worry, the less goes wrong,” I said. So he asked what worries me most? “Not the displacement of human labor by machines, we can solve the resulting social challenges. I worry that the only thing Americans seem to agree on now is that China is our adversary.” And pressing, he asked me to list the things I admire about China. “Okay. I admire China’s work ethic, drive, ambition, economic accomplishments. They’ve overtaken us in many advanced scientific fields. I admire that very much.” He smiled and asked me to carry on. “I’m grateful for their competition. It makes us better. And I admire that they’ve evolved communism to make it work while all others failed. The world is better with diversity of thought, philosophy – diversity increases resiliency, robustness. And democratic free-market capitalism will grow stronger with a formidable competitor.” He smiled. This entry was posted in Bonds, Economy and tagged inverted yield curve, Yield Curve on April 1, 2019 by Bone Fish. A new survey reveals that nearly 80% of people who drink alcohol have shopped on the web while intoxicated. And while the results can be hilarious, drunk shopping is a multi-billion dollar national habit. According to a survey by tech and business newsletter The Hustle, drunk Americans spend approximately $45 billion per year, with an average annual spend of $444 per drunk shopper. Most common? Clothing and shoes, while Amazon remains the shopping platform of choice. The findings are based on a survey of 2,174 alcohol-consuming readers between March 11-18 of this year. The average respondent was 36-years-old, and has an income of $92,000 per year, more than double the national average. Thus, The Hustle‘s wealthier readers may skew the results when extrapolated – but we’re having fun with this one. Women (80%) are slightly more likely than men (78%) to drunk shop. This makes sense since women generally shop more than men — especially online. Drunk shoppers also tend to be younger. Millennials outrank baby boomers by 13%, which might be attributed to the rise of e-commerce (we’ll get to this later). What’s the alcohol of choice while drunk shopping? Beer, followed by wine, followed by whiskey. Another interesting metric is that people who shop while drunk have around 10 drinks per week, while those who typically shop sober consume half as much. Our average respondent reports dropping $444 per year on drunk purchases — from life-size cut-outs of Kim Jong-un to 30-pound bags of Idaho potatoes. A little back-of-the-napkin math gives us a rough estimate of the drunk shopping market at large: There are ~130m alcohol-consuming adults in the US. In our survey findings, 79% of alcohol-consuming adults shop drunk at an average annual spend of $444. Assuming these rates hold true at a national level (purely speculative), drunk shopping is a ~$45B per year market. Extrapolating this further, we determined the average lifetime spend on drunk purchases is $4,187 — good for a total drunken expenditure of nearly half a trillion dollars. When it comes to drunk shopping by profession, those in the fashion industry are the biggest, richest drunks – at an average of $949 spent per year, followed by writers, medical professionals and those in the fitness industry. Who spends the least while shopping drunk? Government workers, engineers and – in last place, those working in retail. Geographically speaking Kentucky is oddly at the top along with Connecticut. Though, the survey may have had one really rich respondent in each state that skewed the results. Who knows. Kentuckians top the charts with a $742 annual spend. In fact, the entire South — a region known for its fine bourbon — is a blanket of red. California, the country’s wine capital, is the lone over-achiever on the otherwise mediocre West Coast. This bears little semblance to the CDC’s analysis of the heaviest binge-drinking states (in fact, it’s almost opposite). But it shows that the economics of drunk shopping is a more complex matter than simply parsing out where people drink the most. As far as platform of choice, Amazon leads the pack, followed by Ebay, Etsy, Target and Walmart. At least two of those are worth an intervention if you ever catch your friends drunk shopping at Walmart, for example. Clothing and shoes are the goods of choice while drunk. Studies have shown that people who base their self-worth on appearance are more likely to imbibe alcohol, so there is some tenuous linkage here. But this also ties in with the rapid rise of the direct-to-consumer fashion industry. Weirdest purchases, according to The Hustle‘s readers? Who could regret $2,200 night vision goggles? This entry was posted in Economy and tagged Drunk Shopping, Online, Shopping on March 30, 2019 by Bone Fish. 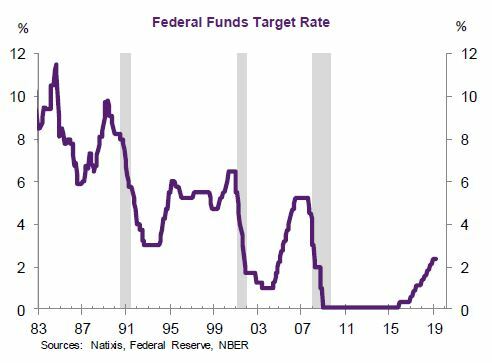 The time between the Fed’s final interest rate hike and its first rate cut in the past five cycles has averaged just 6.6 months, according to Natixis economist Joseph LaVorgna. The bond market has quickly pivoted, and fed funds futures are pricing in a quarter point of easing for this year, just days after the Fed forecast no more hikes for this year. LaVorgna said there are three conditions required for a Fed reversal, and that of a soft economy could soon be met. (by Patti Domm) The bond market has quickly priced in a Federal Reserve interest rate cut this year, just days after the Fed said it would stop raising rates. That has been a surprise to many investors, but it shouldn’t be — if history is a guide. Joseph LaVorgna, Natixis’ economist for the Americas, studied the last five tightening cycles and found there was an average of just 6.6 months from the Federal Reserve’s last interest rate hike in a hiking cycle to its first rate cut. “For example, there was only one month from the last tightening in August 1984 to the first easing in September 1984. This was followed by a four-month window succeeding the July 1989 increase in rates, a five-month gap after the February 1995 hike, an eight-month interlude from May 2000 to January 2001, and then a record 15- month span between June 2006 and September 2007,” he wrote. “The market’s saying it’s going to happen in December,” said LaVorgna. There are three conditions that need to be met for the Fed to reverse course and cut interest rates, LaVorgna said. First, the economy’s bounce back after the first quarter slump would have to be weaker than expected, with growth just around potential. Secondly, there would have to be signs that inflation is either undershooting the Fed’s 2 percent target or even decelerating. Finally, the Fed would have to see a tightening of financial conditions, with stock prices under pressure and credit spreads widening. This entry was posted in Bonds, Economy and tagged Fed, Recession on March 27, 2019 by Bone Fish. Economic data is showing further negative divergence from the rally in the stock market. The Census Bureau finally released January new home sales, which showed a 6.9% drop from December. E-commerce sales for Q4 reported last week showed a 2% annualized growth rate, down from 2.6% in Q3. The economy is over-leveraged with debt at every level to an extreme, and the Fed knows it. I would say the odds that the Fed starts printing money again before the end of 2019 are better than 50/50 now. (Dave Kranzler) The Fed’s abrupt policy reversal says it all. No more rate hikes (yes, one is “scheduled” for 2020, but that’s fake news), and the balance sheet run-off is being “tapered,” but will stop in September. Do not be surprised if it ends sooner. Listening to Powell explain the decision or reading the statement released is a waste of time. The truth is reflected in the deed. The motive is an attempt to prevent the onset economic and financial chaos. It’s really as simple as that. See Occam’s Razor if you need an explanation. As the market began to sell off in March, the Fed’s FOMC foot soldiers began to discuss further easing of monetary policy and hinted at the possibility, if necessary, of introducing “radical” monetary policies. This references Bernanke’s speech ahead of the roll-out of QE1. Before QE1 was implemented, Bernanke said that it was meant to be a temporary solution to an extreme crisis. Eight-and-a-half years and $4.5 trillion later, the Fed is going to end its balance sheet reduction program after little more than a 10% reversal of QE and it’s hinting at restarting QE. Make no mistake, the 60 Minutes propaganda hit-job was a thinly veiled effort to prop up the stock market and instill confidence in the Fed’s policies. LGI Homes (NASDAQ:LGIH) reported that in January it deliveries declined year-over-year (and sequentially), and Toll Brothers (NYSE:TOL) reported a shocking 24% in new orders. None of the homebuilders are willing to give forward guidance. LGI’s average sale price is well below $200k, so “affordability” and “supply” are not the problem (it’s the economy, stupid). of units as estimated by the Census Bureau) sold for each month. I added the downward sloping trend channel to help illustrate the general decline in new home sales. As you can see, the trend began declining in early 2015. Recall that it was in January 2015 that Fannie Mae and Freddie Mac began reducing the qualification requirements for government-backed “conforming” mortgages, starting with reducing the down payment requirement from 5% to 3%. For the next three years, the government continued to lower this bar to expand the pool of potential homebuyers and reduce the monthly payment burden. This was on top of the Fed artificially taking interest rates down to all-time lows. In other words, the powers that be connected to the housing market and the policymakers at the Fed and the government knew that the housing market was growing weak and have gone to great lengths in an attempt to defer a housing market disaster. Short of making 0% down payments a standard feature of government-guaranteed mortgage programs, I’m not sure what else can be done help put homebuyers into homes they can’t afford. 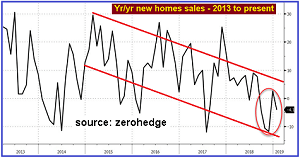 I do expect, at the very least, that we might see a “statistical” bounce in the numbers to show up over the couple of existing and new home sale reports (starting with February’s numbers). Both the NAR and the government will likely “stretch” seasonal adjustments imposed on the data to squeeze out reports which show gains, plus it looks like purchase mortgage applications may have bounced a bit in February and March, though the data was “choppy” (i.e., positive one week and negative the next). The economy is over-leveraged with debt at every level to an extreme and the Fed knows it. Economic activity is beginning to head off of a cliff. The Fed knows that too. The Fed has access to much more in-depth, thorough and accurate data than is made available to the public. While it’s not obvious from its public posture, the Fed knows the system is in trouble. The Fed’s abrupt policy reversal is an act of admission. I would say the odds that the Fed starts printing money again before the end of 2019 are better than 50/50 now. The “smartest” money is moving quickly into cash. Corporate insiders are unloading shares at a record pace. It’s better to look stupid now than to be one a bagholder later. This entry was posted in Economy, Housing Market and tagged US Economy on March 23, 2019 by Bone Fish. More than a third of New York residents complaint that they “can’t afford to live there” anymore (and yet they do). On top of that, many believe that economic hardships are going to force them to leave the city in five years or less, according to a Quinnipiac poll published Wednesday. The poll surveyed 1,216 voters between March 13 and 18. In total, 41% of New York residents say they can’t cope with the city’s high cost of living. They believe they will be forced to go somewhere where the “economic climate is more welcoming”, according to the report. In response to a similar poll in May 2018, only 31% of respondents said they felt as though they would be forced to move, indicating that the outlook among residents is getting much worse – very quickly. The poll also found that minorities have an even more pessimistic outlook on things. Non-whites disproportionately ranked their situations as “poor” and “not good” according to the poll. This entry was posted in Economy, Housing and tagged New York on March 23, 2019 by Bone Fish. The most prescient recession indicator in the market just inverted for the first time since 2007. As we noted below, on six occasions over the past 50 years when the three-month yield exceeded that of the 10-year, economic recession invariably followed, commencing an average of 311 days after the initial signal. And here is Bloomberg showing how the yield curve inverted in 1989, in 2000 and in 2006, with recessions prompting starting in 1990, 2001 and 2008. This time won’t be different. On the heels of a dismal German PMI print, world bond yields have tumbled, extending US Treasuries’ rate collapse since The Fed flip-flopped full dovetard. Critically, as Jim Grant noted recently, the spread between the 10-year and three-month yields is an important indicator, James Bianco, president and eponym of Bianco Research LLC notes today. On six occasions over the past 50 years when the three-month yield exceeded that of the 10-year, economic recession invariably followed, commencing an average of 311 days after the initial signal. While Powell stressed over and over that the Fed is at “neutral,” . . . the market is saying the rate hike cycle ended last December and the economy will weaken enough for the Fed to see a reason to cut in less than a year. This entry was posted in Bonds, Economy, Mortgage and tagged inverted yield curve, Recession, Yield Curve on March 22, 2019 by Bone Fish. The bond bull market is alive and well with yesterday’s bond-bear-battering by The Fed extending this morning. …completely decoupled from equity markets…. This entry was posted in Bonds, Economy and tagged inverted yield curve, Recession, Yield Curve on March 21, 2019 by Bone Fish.